Another re-watch! The first time I saw Anchorman was on terrible loudspeakers in a college coffee shop, so another attempt was definitely due. The occasion upon which I viewed this for the Challenge was my third attempt, and I can still say I find it entertaining. The jokes are still great, and the characters are still ridiculous. Nothin’ wrong with that. The gist: Ron Burgundy (played wonderfully by Will Ferrell) is one of the best news anchors in the world. Or at least he thinks he is, and is told so by everyone else in San Diego. He reports on all the news fit for television, and is the king of the ratings. He and his news team are best buds, and they are killing it. But everything changes when beautiful (and the far more professional) Veronica Corningstone. She’s played by Christina Applegate, the ultimate straight woman and the perfect audience surrogate for this crazy alternate world. The two start dating, and everything’s great. But when Ron’s held up one day and Veronica reads the news on the air, the tide begins to turn. Ratings don’t lie: People like a woman reading the news, and Veronica’s great at reporting sound stories. Is there room for two amazing news anchors in San Diego? 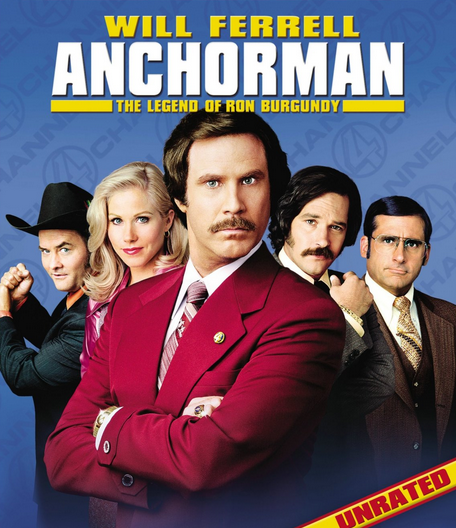 Or will Ron Burgundy lose his crowning glory to the same woman who stole his heart? What I “learned”: The way to talk about serious issues isn’t with serious movies. It’s with outlandish movies, preferably comedies. Unity through laughter, as Gabriel Iglesias would say. I was delighted in 2013 when I heard about the Newseum in Washington D.C. was putting together an entire exhibit around Anchorman. It featured props from the original movie, but also went in depth about sexism during real newsrooms in the 1970s. And that’s the true genius behind this film: It’s a film about sexism that doesn’t feel like a movie about sexism. The writing is great, and the actors are committed. It’s a good time. It probably inspired more conversations about sexism in the workplace than a stone-serious documentary about worker strife ever did. This is how change happens, people. See this movie if you like: Comedies centered in their own universe. The characters in this 1970s San Diego are outrageous, proclaiming they’re the best at “fightin,’ screwin’ and readin’ the news!” But everyone reacts in just the right way, and the world feels complete enough to take their ridiculousness. Avoid this movie if: There really isn’t a reason to avoid this movie. Even if you’re not into toilet humor, there’s plenty of wordplay and random-as-all-get-out jokes to keep people interested. It’s a quotable movie much like Mean Girls, and there’s just as much care and attention paid to the characters. Plus, it’s only 94 minutes! You have nothing to lose at that length.